Sunday 5th August at 7.00 p.m. Certificate 12A ~ 114 minutes. 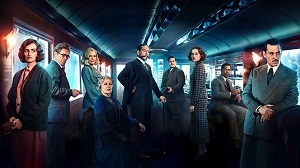 Hercule Poirot, the best detective in the world decides to leave on the Orient Express. The train accidentally gets stopped because of a small avalanche. Little did he know that a murder was planned and that a person on this train was able of committing such crime. Will he solve this murder before the train starts working again? And the cast: what a cast! Dame Judi Dench; Olivia Coleman; Johnny Depp; Daisy Ridley; Penélope Cruz; Josh Gad; Derek Jacobi; Willem Dafoe and Michelle Pfeiffer. A real case again of an “oh, it’s you” film again – when’s the last time we saw that?